This post was going to be about the desert we made to follow the gorgeous roast chicken, or the green beans with pistachio pesto or even what we did with the left overs. 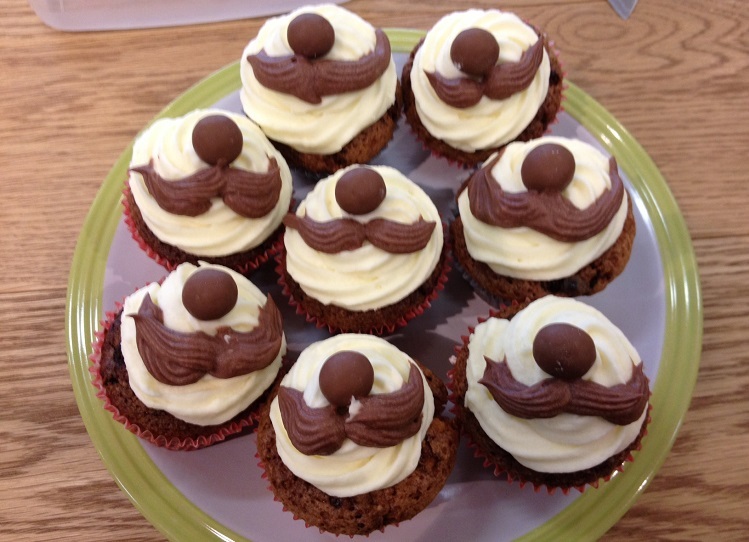 But after Hana baked these last night it had to be about these gorgeous Movember cupcakes. Movember is a global phenomenon, each year men across the globe stop shaving their mustaches for the month of November and to raise money and awareness for men’s health issues like testicular cancer. Though she can’t take part herself Hana has joined in the office bake-sale the last couple of years baking movember cupcakes, you can find last years here. I think this years were even better than last. They look great with their little mustaches. I think they went down a treat at the bake sale and sold out pretty quickly! I was lucky enough that the mixture mad a couple too many to fit in the box to take them in so I had a lovely little cupcake this afternoon with a cup of tea whilst doing my work. So a big thanks to Hana for my little treat. 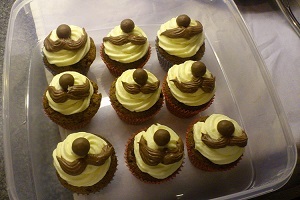 Hana used the recipe from her Malteser Chocolate bar cupcakes which you can find on my chocolate bar cupcakes page (link at the top) along with a few other naughty treats. The mustaches are piped on with the same butter cream icing with a bit of melted dark chocolate added. I hope you have all had a happy Movemnber and are looking forward to Christmas just around the courner. What could be more manly than beer cupcakes? Ok, maybe a steak and a beer, but I couldn’t come up with a way to make steak cupcakes that wouldn’t be completely gross.